This page is for Easter Eggs only. Easter Eggs include inside jokes, pop culture references, and any similar reference to something outside the Elder Scrolls games. For other points of interest, like unfinished quests, or references to other games in the Elder Scrolls series, please see the appropriate pages. Easter Eggs are secrets that the developers put in the game to give people a laugh when they find them. Skyrim has a large number of such jokes. Easter Eggs differ from in-game references in that they have been intentionally hidden from the player and are unusual with regards to their surroundings. Cultural References are objects, characters, or events in the game that refer to a specific element of popular culture; they differ from Easter Eggs in that they are usually integrated into the game world, and strong parallels can be drawn between the in-game event and the specific work being referenced. Cultural references also include allusions to elements of real-world culture, such as historical events and folklore. If you think you have found an Easter Egg or reference, please post your idea on this article's talk page before adding it to this article. 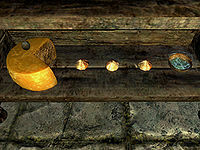 In Endon's house in Markarth, there is a shelf where garlic, glow dust, sliced goat cheese, and a slaughterfish egg are arranged to resemble Pac-Man eating several pac-dots. When entering Sovngarde during the main quest, several of the statues lining the stone steps that lead down from the portal to Skuldafn Temple will rotate as you descend. A room in the main area of Fort Dunstad appears to be a latrine. In this room, on a stone shelf beside one of the "toilets" is a Potion of True Shot, a possible joke by the game's developers about aiming during urination. During the quest The Mind of Madness, you will encounter Sheogorath having a tea party in the middle of a forest. This is a reference to Lewis Carroll's Alice's Adventures in Wonderland. During the quest Innocence Lost, when you enter the orphanage, you will hear Grelod the Kind shout at the children "What do you say? ", to which they respond "We love you Grelod, thank you for your kindness!". This is very similar to the musical "Annie", in which the orphans were frequently asked "WHAT DO YOU SAY?" and the response was always "We love you Miss Hannigan." Northeast of Bleakwind Basin, protruding from an unmarked small pool is a skeletal arm holding a sword. The Lady Stone is also located on a small island in the middle of a lake. These are references to The Lady of the Lake in Arthurian lore. Just outside of Rebel's Cairn, northwest of Rorikstead, you will find a sword in a stone, a well-known icon in Arthurian lore. After starting the Ill Met By Moonlight quest, you will hunt down a white stag, which is found in many Arthurian stories, symbolizing adventure and the hunt. 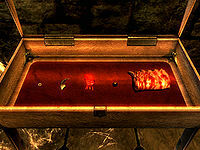 In the room to the left of the grand hall of Volkihar Keep, there is a display case containing a hagraven's claw, a sabre cat's eye, a daedra's heart, a dog's ribcage, and a gold ring. This is a nod to Castlevania II, in which Simon Belmont must collect and destroy the nail, eyeball, heart, ring, and ribcage of Dracula to defeat him. Two huskies, Bran and Sceolang, are present in Fort Dawnguard. In Celtic mythology, the hunter-warrior Fionn mac Cumhaill (Finn McCool) had two previously human hounds sharing these same names. In Shalidor's Maze, opening one of the shutters within the maze reveals a severed head with a gold coin in its mouth. This is a reference to Charon's Obol, the ancient Greek and Roman custom of placing a coin in the mouth of the deceased prior to burial. Kolb & the Dragon is a book written in the style of Choose Your Own Adventure. A character named Kluwe "who went by Loate when hiding his face" appears as a member of Ysgramor's Five Hundred Companions in the book Songs of the Return, Volume 7. This is a reference to ex-Minnesota Vikings punter Chris Kluwe, who played World of Warcraft for several years as a troll rogue named Loate. In the Dark Brotherhood quest line, you will encounter an assassin named Cicero. This is likely a reference towards the Roman philosopher and statesman Cicero, who was a close friend of Cassius, one of the assassins of Caesar, and openly endorsed the assassination after it had passed. The death hounds CuSith and Garmr are references to Cù Sìth and Garmr, two legendary dogs from Scottish and Norse mythology, respectively. If you go back up the road from Riverwood to where you exited the cave after the prologue, there is a cave called Embershard Mine. This refers to the popular Dungeons and Dragons podcast that Mike Krahulik, Jerry Holkins, Scott Kurtz, and Wil Wheaton played in to showcase the new fourth edition of the game. In it, Scott Kurtz's character, Binwin Bronzebottom, refers to how his dwarven father stopped drinking because the Embershard family of dwarves stole their mine. A note found on a skeleton refers to the same, but with a Nordic, not dwarven, theme. In the cave Liar's Retreat, you will find a Breton named Rahd, dead on an altar, who is referred to at one point as "Longhammer" (and carries a weapon by the same name). This is a reference to the 4th session of the D&D group Acquisitions Incorporated played by the members of Penny Arcade, PVP, and Wil Wheaton, in which Wheaton's character is rescued from hell along with an NPC named Rad Longhammer. In the Ratway, the first enemies you meet are a sneaky-looking fellow and a barbarian type called Drahff and Hewnon Black-Skeever. This references the adventures of Fritz Leiber's "Fafhrd and the Gray Mouser". Drahff is an anagram of Fafhrd, "black-skeever" is a play on "gray-mouser" and Hewnon is an anagram of Nehwon, the world in which Fafhrd and the Gray-Mouser live. When near Sheogorath, he will sometimes say "Do you mind? I'm busy doing the fishstick. It's a very delicate state of mind!" This is a reference to the Fishy Stick meme which began on Bethesda's Official Forums and went on to become a running gag in TES games. When you first enter the Frozen Hearth in Winterhold, the innkeeper will complain to Nelacar about conducting experiments at the inn—"Like some horrible monster was turned inside out, and then exploded. "—a line very similar to one from the movie Galaxy Quest. The quest A Night To Remember is an homage to the movie The Hangover. In the quest, you travel around Skyrim looking for your drinking buddy Sam and cleaning up all the problems you created while you were drunk. The miscellaneous objective to help hold citizens as a step towards becoming a thane is referred to in the game's files as Making Friends and Influencing People, a reference to Dale Carnegie's bestselling self-help book How to Win Friends and Influence People. These files can only be viewed on PC with the console or the Creation Kit. The possible follower Belrand occasionally mentions a game he played as a child, "Seek the Wumpus", derived from the classic computer game Hunt the Wumpus. The runic wheel on the second page of the Oghma Infinium is based on the Vegvísir, an Icelandic magical sigil circa 17th century. When Athis is asked why he joined the Companions, his response is "Fortune and glory, friend. Fortune and glory." This is a reference to a very similar line from Indiana Jones and the Temple of Doom. In the Dark Brotherhood, there is a vampire named Babette. In Anne Rice's novel Interview with the Vampire, Babette is the protagonist's first love interest. The body of a young girl, however, is a reference to Claudia, the protagonist's "daughter", who was over 70 years old in the body of a 5 year old. During the night, you may encounter a Headless Horseman, a reference to Washington Irving's "The Legend of Sleepy Hollow". During the quest Proving Honor, the Companion Farkas says to you "It's a secret to everybody. ", a phrase popularized by The Legend of Zelda video games. In the quest Salt for Arcadia, you will deliver frost salts to the alchemist Arcadia, who says she intends to use it to create a love elixir. This is a nod to the 1992 movie Love Potion No. 9, where the love potion at issue turned out to be concentrated salt. At the top of the Throat of the World, you can find a Notched Pickaxe that provides a bonus to Smithing. The name (Notch is the nickname of the creator of Minecraft), the tool (the pickaxe is a commonly used tool in Minecraft), and the bonus (a major part of Minecraft is to create your own equipment) are all references to Minecraft. A line of text found on the Dragon Wall containing the second word of the Whirlwind Sprint shout states that "Oblivion hath no fury like [a] shield maiden scorned." This is a play on the adage "Hell hath no fury like a woman scorned", which was coined by William Congreve in his play The Mourning Bride. In the quest Promises to Keep, you are able to get a birth certificate mentioning Sleipnir, the great grandsire (grandfather) of Frost. Sleipnir is the eight-legged horse of Odin in Norse mythology. Frost's sire is Grane, another horse of Norse mythology (Grani in the myths). Grani is a descendant of Sleipnir, and is named by Sigurd due to Odin's advice. Frost's great damsire is Loka, which is possibly a reference to Loki the god, who was Sleipnir's mother. Several of the souls in the Soul Cairn will say "I live in a dark world, where no light shines through. I carry this burden with every step I take." These are lyrics from the song Dark World Burden by death metal band Novembers Doom. The souls may also say "Only those who have suffered long can find the light within the shadows", which are lyrics from The Pale Haunt Departure. In the quest The Cure for Madness, Astrid's horse Shadowmere resurrects from a pool of murky water. When this happens, a journal entry reading "Behold Shadowmere" is presented. The relevant quest stage for this entry is 666 and is clearly referring to "the number of the beast", a common association in mainstream Satanism/demonism as well as in popular culture. It should be noted that quest stages can only be observed on the PC version through the console or Creation Kit. In the quest Dampened Spirits, you encounter a not-quite-sane mage named Hamelyn, whose journal describes how he has created an army of skeevers. This is a reference to the famous story of the Pied Piper of Hamelin. In the quest The House of Horrors, when you become locked in the abandoned house in Markarth and the poltergeist activity starts, there are a load of chairs stacked in a precarious manner on a table. This is probably a reference to the famous scene in the 1982 movie Poltergeist, where the entities haunting the family's house do exactly the same thing. During combat, Brynjolf may exclaim "So it's to the pain then!" This is a reference to Westley's famous threat to Prince Humperdinck in The Princess Bride. In the quest The Mind of Madness, Pelagius' Confidence and Anger are manifest as actual beings fighting each other, and Paranoia is one section of Pelagius' mind that must be overcome. The conflict between Confidence and Anger is similar to an early episode of the British sci-fi comedy Red Dwarf, when during the episode "Confidence and Paranoia", Dave Lister contracts a mutated disease and his Confidence and Paranoia are made into human form as an effect of his illness, during which time they strive to undermine and eventually kill one another. A generic piece of dialogue sometimes uttered by male drunks and bandits during a fight is "Remember... hit the one in the middle!" This is the advice given by Paulie in Rocky IV to help Rocky overcome double vision, which can be caused by both drunkenness and head trauma. 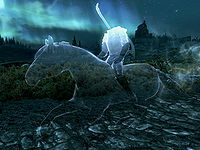 The quest title Promises to Keep is a line from the poem Stopping by Woods on a Snowy Evening, and the quest-related horse "Frost" is an homage to the poem's author, Robert Frost. You can talk to Enthir at the College of Winterhold and say "I understand you're an elf who knows how to get things." This is a reference to the 1994 film adaption of Stephen King's The Shawshank Redemption. An NPC called Temba Wide-Arm is a reference to a line in a Star Trek: The Next Generation episode called "Darmok", where an alien who only speaks in allegories repeatedly says "Temba, his arms wide." She is a Nord residing at the Ivarstead sawmill. In the book Great Harbingers, Cirroc the Lofty is listed as the first Harbinger of the Companions to be an outsider. The name alludes to Cirroc Lofton, the actor that played Jake Sisko in the television series Star Trek: Deep Space Nine. When speaking to Urag gro-Shub (the librarian at the College of Winterhold), he will eventually say "But at the same time, all of it is true. Even the falsehoods. Especially the falsehoods." This is very likely an homage to this exchange between Garak and Bashir in Star Trek: Deep Space Nine. If you venture into Bleakcoast Cave, you will find inside some interesting things. 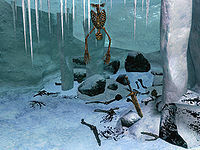 The first is a frost troll; once you have found and killed the frost troll, nearby will be a skeleton hanging upside down from the ceiling with a sword on the ground. This is a reference to Star Wars Episode V: The Empire Strikes Back, in which Luke Skywalker finds himself trapped by a Wampa in a cave and uses the Force to reach for his lightsaber. A similar reference appeared in the Morrowind expansion Bloodmoon. During the quest Darkness Returns, you can recover Nystrom's journal, detailing a plot by two individuals to try and infiltrate the dungeon and its priests. The two are Nystrom and Anders, a reference to Anders Nystrom, guitarist and songwriter from Swedish metal band Katatonia. The unknown phrases in the last paragraph ("He also mumbled some nonsensical phrases like 'night is the new day' and how he was the 'ghost of the sun.' I have no idea what these cryptic sentiments mean, but hopefully during tomorrow's ritual, Anders and I will put everything we've learned to the test.") are references to multiple Katatonia albums and songs—the most obvious being the album Night is the New Day and the song "Ghost of the Sun" from the album Viva Emptiness. When completing this quest, you will jump into a hole. In the hole is a skeleton containing Anders's message. 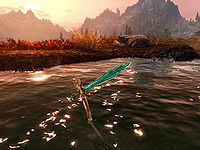 Directly south of Markarth, near Purewater Run, there is a stone bridge near a waterfall. If it is your first time there, you will see three goats; upon looking under the bridge, you will find a dead troll. This is a reference to the children's story "Three Billy Goats Gruff". A similar reference was also found in Oblivion. Peryite, the Daedric Prince of plague and pestilence, has a shrine dedicated to him on a cliff in the wilderness of the Reach. In an alcove at the base of the cliff to the southeast, two corpses can be found with poisons and a dagger lying between them, a reference to William Shakespeare's Romeo and Juliet (and to the famous line in Act 3, scene 1, 90–92). The name of the quest Ill Met By Moonlight is directly taken from the line "Ill met by moonlight, proud Titania. ", spoken by the fairy king Oberon in Act 2 of A Midsummer Night's Dream. During the quest Unfathomable Depths, you will encounter a dead Argonian named Watches-The-Roots in Avanchnzel. In William Blake's The Marriage of Heaven and Hell, one of the "Proverbs of Hell" states "The rat, the mouse, the fox, the rabbet; watch the roots; the lion, the tyger, the horse, the elephant, watch the fruits." In addition, the text of The Marriage of Heaven and Hell specifically deals with ancient and forbidden knowledge; the reward for the quest is a permanent bonus to smithing, titled "Ancient Knowledge". Blake describes hanging over a pit of spiders in his work said to be a vision of Hell, suggesting the skeleton over the pit in Avanchnzel with four spiders at the bottom may represent Blake. 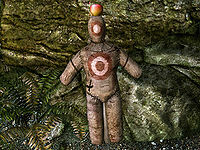 In Swindler's Den is an archery training dummy with an apple perched on its "head", a nod to the famous story of William Tell, the master crossbowman who was forced to shoot an apple off his son's head. M'aiq the Liar, the recurring character whose comments are references to events and features of the game (both new and removed), jokes, and Easter Eggs. This page was last modified on 1 June 2018, at 00:52.